Sphero is a Bluetooth-enabled smart ball-shaped robotic toy that can be programmed by people of all ages. 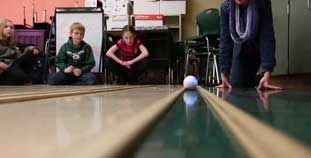 Sphero has developed a program called SPRK (Schools Parents Robots Kids) that helps educators smoothly integrate Spheros into everyday classroom. It’s an easy, safe, and fun device to use with kids of all ages that schools throughout the world are using on daily basis. The Sphero is controlled/programmed by free mobile apps (iOS/Android) to work with any mobile device. There is a simple walkthrough in the app or in the Sphero instructions that shows how to connect and control the Sphero. Also, there are two free apps designed specifically for programming the Sphero, MacroLab and OrbBasic. Finally, there are lots of video tutorials on the Sphero site as well as an online community and Sphero Ranger “meetup” to help users learn how to program with the Sphero. Within minutes, a student or teacher can start using the robot right out of the box with any mobile device. Also, there are over 30 mobile apps that can be downloaded to use with the Sphero including Augmented Reality. Plus, it helps teach programming, robotics, math, and computer science to kids of all ages. Educators are using Sphero with the free educational resources to teach Math, Computer Science, and Programming, to kids of all ages. They are learning different educational concepts such as: percentages, variables, angles, Geometry, Logic, and more. Also, Libraries, LRC’s, Computer labs are using Spheros to help engage students and integrate technology into their daily lives. Sphero can be seamlessly integrated into any classroom. From the younger kids just having fun controlling the robot to the older ones learning how to program, this is a safe and effective device to teach kids a variety of skills while allowing them to have fun.